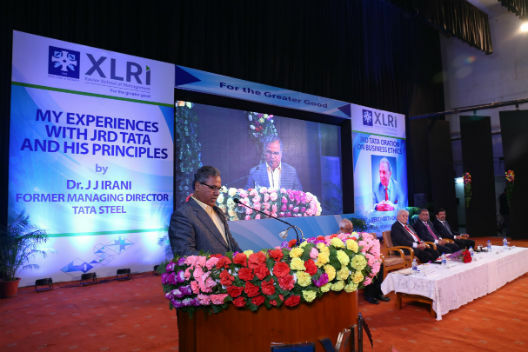 New Delhi: XLRI- Xavier School of Management, one of India’s premier B-Schools recently hosted the 26th Annual JRD Tata Oration on Business Ethics. 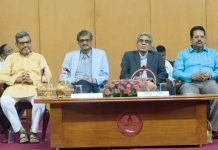 Padma Bhushan, Dr. Jamshed Jiji Irani, Eminent Industrialist and Former MD, Tata Steel delivered the oration this year at XLRI Campus on November 29th, 2017. In his speech, Dr. Irani spoke about ‘My Experiences With JRD And His Principles’- which was the topic of the oration. “J R D always said that before India becomes a “great” country, he would like it to be a “happy” country. He tried to convey that view even to Jawaharlal Nehru who was his friend,” he said in his address. The session was attended by Mr. T. V. Narendran (Chairman, Board of Governors, XLRI & MD, Tata Steel Limited), Fr. E Abraham, S. J. 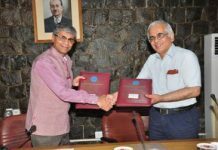 (Director, XLRI), Dr. Ashis K. Pani (Dean [Academics], XLRI) and Fr. Oswald Mascarenhas, S.J. (JRD Tata Chair Professor of Business Ethics at XLRI). 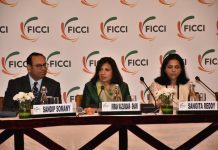 “XLRI has always underscored on the importance of adopting an ethical code of conduct within the corporate world. We believe that no management education curriculum is really complete, unless and until the students are instilled with a set of values that are necessary decision-making ingredients for the corporate manager today. It is for this reason that a core course on “Managerial Ethics” is offered to all our students at XLRI. In 1991, XLRI in association with a few select Tata Group Companies established the XLRI-JRD Tata Foundation in Business Ethics to mark their long-standing commitment and contribution to business ethics in India. The Foundation seeks to address itself by publicly affirming the imperative need for ethics in business and striving to shape an enabling eco-system to foster ethical practices in business. The annual JRD Tata Oration on Business Ethics is an event that has been of singular significance to us, ever since it was initiated in 1991. Mr. JRD Tata, himself a role model extraordinary, as the first orator, set the gold standard for the successive Ethics orations for over two decades. We at XLRI have been truly privileged to have had distinguished speakers from different realms to visit us here in Jamshedpur and share with us their thoughts and experiences in the field of business ethics and many other walks in life,” Fr. Abraham added. 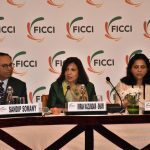 “Globalization has further enhanced the ethical issues in business. Corporations have entered a new era, the “prove to me” era. There is an increasing expectation from stakeholders for businesses not only to say they are ethical, but to prove they have ethical values embedded throughout their organisation. Globalization means that business strategy and business ethics cannot be separated from each other. The culture of an organization is established by the tone set at the top. Chief executives must lead by example,” Fr. Abraham further said in his address. On the occasion, Fr. 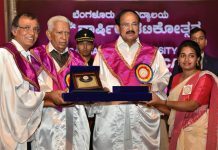 Abraham also announced that XLRI would also release a book to mark the joyous accomplishment of 25 years of JRD Ethics Oration. The book, which is an anthology of all the brilliant orations delivered by esteemed orators over the 25 years beginning with Mr. JRD Tata himself.